Baseball San Jose: Why Not the A's in San Jose? LEED is a certification standard used to measure how "green" a building is, specifically measuring the environmentally sustainability of the design, construction, and operation of the building. There are 4 different obtainable rankings: LEED Bronze, LEED Silver, LEED Gold, and LEED Platinum... the last of which is essentially a tree-house powered by hugs. There are only 15 or so LEED Platinum high-rise buildings in the world, and 3 of them are in Downtown San Jose. As you might have guessed from this post's title, Adobe owns all 3. Despite already being at the very highest echelon of green, they managed to find a way to take it to the next level. Adobe will install 4 "Bloom Boxes" on top of each tower, which will generate 1/3 of the energy required to run the entire complex. In a nutshell, a Bloom Box is a futuristic fuel cell array that generates up to 100 kilowatts of electricity using air and natural gas while producing little to no emissions. Adobe will have a total of 12 of these to complement the 20 turbine wind farm they have already installed on site (seriously, take a good look at the towers next time you're in downtown, you can see them). For more information on Adobe's quest for LEED certifications that have yet to exist, check out this GreenBeat article. I just wanted to quickly plug a new organization dedicated to making San Jose the model of animal welfare awareness. San Jose Animal Advocates is trying to spread the word about local animal shelters and rescue groups and hopes to make the community more aware of pet overpopulation and encourage residents to make a difference in the lives of animals. Fore more information, please take a look at their website right over here or a recent article published on them in the Rose Garden Resident. 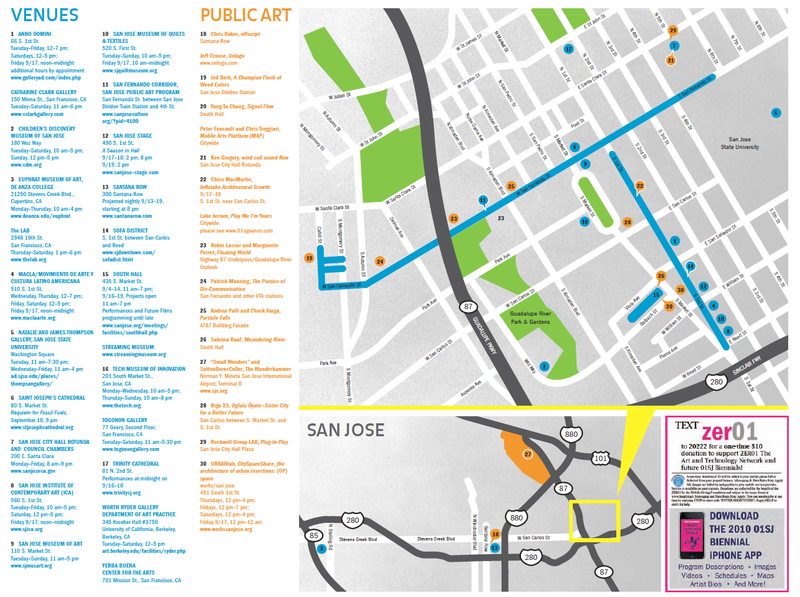 Spirit of Japantown Festival in San Jose! Looks like a great event is coming to Japantown this weekend in celebration of its 120 year history. All sorts of Japanese cultural entertainment, food, art & crafts, music, and exhibits are taking over 7 city blocks in Japantown! For more information, check out this link. Also, an inside scoop on some of the food there from Kathy Sakamoto: "Spirit of Japantown FOOD! : Willydog (kimchee burritos-yes-that's what we said! ), TREATbot, Tengu Sushi (sushi and spam musubi), Mariani's sausage sandwiches, Yogurtworks, Nijiya Market (okonomiyaki, yakisoba), LOCO GRINDZ-fried rice & noodles, Portuguese sausage, Quickdog "traditional"hotdogs!, Jamba Juice, House of Si...am (Thai food from the two sisters! ), Corn-fu (kettle korn), Momiji Kayo Club gyoza..G.Biersch, Sapporo, Primo, Kirin, Ito-En drinks...more!" San Pedro Square Market Update! Veggie Box and Crewners Sign Leases! Veggie Box: Fresh from the Valley of Heart's Delight, Veggie Box brings the best of California produce, gourmet goods, and prepared foods to the San Pedro Square Market. Owner Diana Foss is committed to serving only the finest fruits, vegetables, and gourmet goods. She will offer products which are simply not available anywhere else. Taste the difference that truly local makes. Crewners: A unique, yet traditional barbershop offering precision haircuts and straight razor shaves for gentlemen. Crewners includes a beautifully restored vintage barber chair. Owner Dan Dixon is the most talented and charming barber you’ll ever meet. SJ Development Forum: clubHOUSE Coming Soon to Downtown! The signs from Hawgs were taken down yesterday and the new signs for clubHOUSE were put up today. Can't wait to see the interior when it opens. Just a quick post to share the video feed for this year's The Tech Awards. You can see all of the action just by clicking here. Press release below. toward the common goal of improving our world and its people. former laureate and an opportunity for a virtual Q&A. celebrate technology and innovation benefiting humanity. Great indie band is coming to Johnny V's on the 26th. They'll also be doing an afternoon show earlier that day in San Jose's Streetlight Records. You can have a listen over at their Myspace page (start with Wasting Away, I really like that one). BURN THE FLOOR Sets Downtown San Jose on Fire! Okay, I think it's time for me to come clean with everyone. The show "So You Think You Can Dance" has become a guilty pleasure of mine. Perhaps around season 2 or 3, my wife started watching it and I was forced to be a passive viewer. I would sit on the couch with a laptop in front of me, doing work or surfing the web... not really paying much attention to what's going on. A season later, I would put down the laptop anytime a hip-hop routine came on. Fast forward to their last season and magically the laptop was nowhere to be found whenever the show came on. What I think that show really did for dance was take decades of tradition, and modernize the heck out of it so that even people that know absolutely nothing about dance (e.g. me) can enjoy it. BURN THE FLOOR essentially did the exact same thing to ballroom dancing. They took elements of traditional ballroom as well as jazz, contemporary, and even paso doble routines and made it so that literally anyone can enjoy it. This isn't just a good show for people that like watching dance... it's a good show period. The routines are simply amazing. You'll see moves that human beings shouldn't be able to physically pull off. What's even more impressive is how these moves can be consistently executed throughout the performance without any slips or falls. The level of talent required for this show is off the charts... all of the dancers were at least great, and some were astounding. The "So You Think You Can Dance" graduates--Pasha, Anya, Ryan, and Ashleigh--were definitely in the astounding category. There was even a special cameo from "So You Think You Can Dance" judge, choreographer, and hot tamale train conductor, Mary Murphy! Backing up the dancers are twin percussionists and talented singers that help keep the mood lively from curtain to curtain. The sets were fantastic. Choreography? As good as it gets. How about the pace? The show never got boring, even for someone with a very short attention span (last time I saw The Nutcracker, I fell asleep at least 3 times). In a nutshell, this is the best show I've seen at the San Jose Center for the Performing Arts. If you're interested, I would try to get tickets before they're all sold out. Here's the direct link! Buoyed by the recent show of Silicon Valley corporate support, the City Council tonight passed another resolution in support of an A's move to San Jose. The vote was unanimous, though clearly, everyone is getting antsy. Councilman Liccardo, noting that Milwaukee recently erected a statute in honor of MLB Commissioner Bud Selig, even jokingly offered to build him a replica in San Jose. 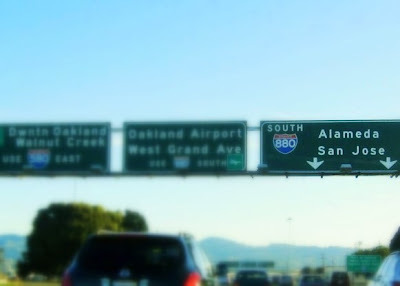 Still, the fact remains that San Jose is admirably positioned to land the A's. Certainly, no other location in the Bay Area can boast such an attractive offer. You're up to bat, San Jose! Alaskan Airlines just keeps pumping out more and more flights out of SJC. Beginning Dec. 15th, Alaskan will add 4 flights per week to Guadalajara. The flights will leave at 10:50pm on Mon, Tues, Thurs, and Sat and arrive at 5:00am local time the following day. For more info, click here. Main event starts at 7p.m. Michael Foley will be there making $5 portrait transformations, creating stylized portraits you'll not find anywhere else. Michael Foley is an artist from the San Francisco bay area whose works show nationally and internationally. First discovered by scientists after the great quake of 1906. Believed to be the cause of the catastrophe it was decided that he would be placed deep in the arctic sea to be forgotten. 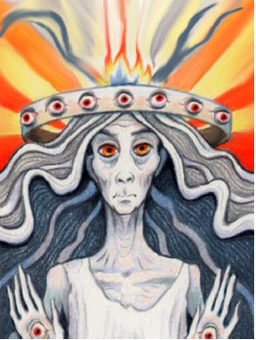 Seventy-Two years later he resurfaced and returned to California to exact his revenge on civilization through the use of art and his poorly scripted interpreted dance and slam poetry. MoGo BBQ is a mobile food truck company serving up Koreanstyle BBQ in our taco truck serving the San Francisco Bay Area: San Jose, Oakland, Berkeley, Palo Alto, and more. 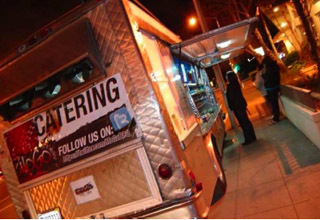 They bring you the convenience of affordable gourmet food combined with good olʼ Korean family recipes handed down to them, resulting in portable street food fare. Take your pick from our Short Rib Tacos to our Spicy Pork Quesadillas—theyʼre all up for the tasting'. 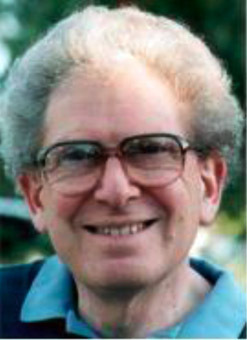 Russell Targ is a physicist and author who was a pioneer in the development of the laser and laser applications, and was cofounder of the Stanford Research Instituteʼs investigation into psychic abilities in the 1970s and 1980s. His work in this new area, called remote viewing, was published in Nature, The Proceedings of the Institute of Electrical and Electronics Engineers (IEEE) and the Proceedings of the American Association for the Advancement of Science. Targ has a B.S. in Physics from Queens College, and did graduate work in physics at Columbia University. In 1997 Targ retired from Lockheed Martin Missiles & Space Co. as a senior staff scientist. Randall is an award-winning actor, most recently appearing with the Company as Milan and The Waiter in ROCK ʻNʼ ROLL. He has performed in leading roles at many theaters, including San Jose Repertory Theatre, Berkeley Repertory Theatre, Sacramento Theatre Company and the Alaska Theatre Festival, among others. 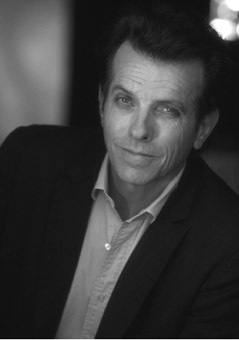 Randall has worked with Francis Ford Coppola, Lawrence Kasdan and Michael Bay, among others, and has also appeared in numerous television projects. 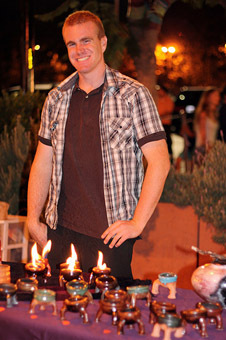 Keith Bunnell is a ceramic artist based here in Silicon Valley. He focuses on what he refers to as "the dark side of pottery, bringing out the true fear that resides within the clay." 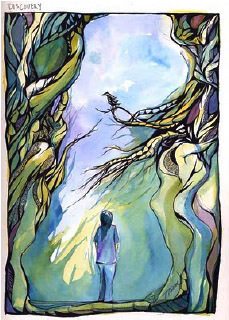 Trina Merry, an American artist, currently lives in the Bay Area in a little town called Willow Glen. After receiving her BA in Communications/Media from Azusa Pacific University, she worked for companies like Sony, Paramount, Icon Productions (Mel Gibson), Yamaha, & Showtime's Golden Globe nominated TV Show "Sleeper Cell" (art department). 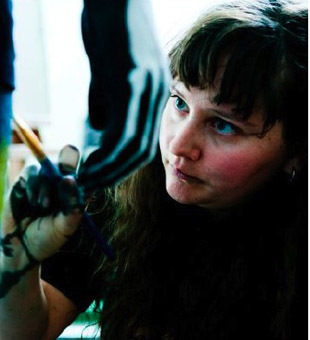 She is truly a multi-media artist working in paint, video/film, installation & performance. 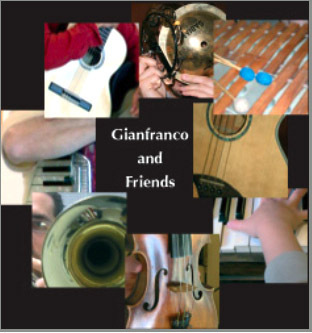 Gianfranco & Friends - It all started for the love of the accordion sound and the passion of meeting the very friendly local musicians. Gianfranco had courage to ask them, one at a time, to do some notes together. The first he had asked was Kate and the answer was a curious: "Marimba and accordion? Yes...When?...Where?". A few weeks later he asked Jessica, and the answer was just lovely: "Piano and accordion?...Do they have a piano there?...OK...When?". Well.....We did our first notes at the Caffé Trieste and I continue to do notes at the caffé every second Friday of the month with all my friends musicians. That's how "Gianfranco and Friends" came alive around San Jose. TWO BUCK Tuesday- September 21st, 7-10pm FREE and open to the public. Looks like the Plaza is coming along nicely. This is where you'll be able to enjoy al fresco dining, music, and entertainment throughout the year... all while enjoying the company of the oldest structure in San Jose, The Peralta Adobe. BURN THE FLOOR is Coming to San Jose! A very popular Broadway-caliber show featuring many famous dancers is playing Downtown from Sep. 21st through the 26th. I'm hoping to catch it early in the week and do a full review. For now, there's a video preview below and a direct link to see ticket options right over here. 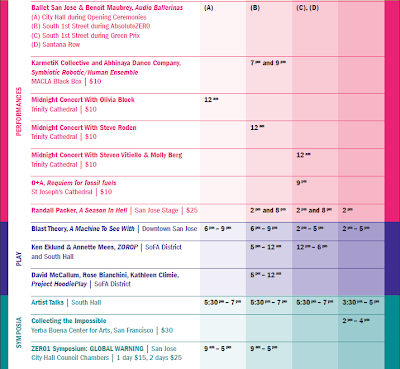 I rarely promote events outside of San Jose, but this one seems particularly unique. I've never even heard Cajun music before, so I thought I would toss this out there for anyone interested. Cajun fiddler Joel Savoy (son of master accordionist Marc Savoy) is spearheading a growing movement of young Cajun musicians taking back their roots music. Founder of the Grammy-nominated label Valcour Records and the acclaimed Red Stick Ramblers, Savoy is equally at home playing the old twin-fiddling of Cajun masters like Dennis McGee, as he is playing swing or country fiddle for honky-tonk dancing. He’s touring now with Cajun accordionist and vocalist Jesse Lége. Growing up in a rural, pre-electricity home in Gueydan, Southwest Louisiana, Jesse spoke Cajun French as a first language and learned music from relatives, neighbors and the family’s much-loved battery-powered radio. Listening to the Grand Ol’ Opry was as natural to him as staying up late at a Cajun fais do-do, and he brings that love of old school country and Cajun music to his collaboration with Joel Savoy. Jesse sings in the classic, old-school style of Cajun vocalists, and since French is his first language, he’s able to write new songs in this old style. He’s a master of Cajun dancehall music and the real deal. A group of local citizens from the Crush Proposition 23 Campaign rallied outside of a San Jose Valero gas station yesterday. 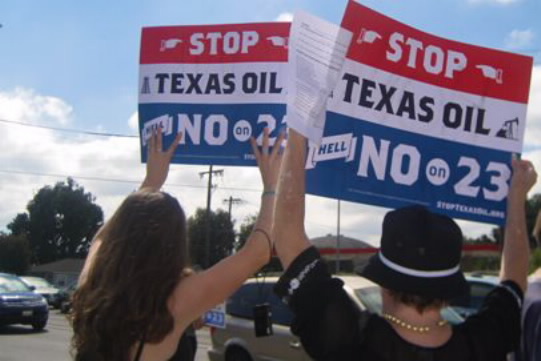 The rally was part of a state-wide effort to defeat Proposition 23 - a deceptive ballot initiative funded by Valero and other Texas Oil companies that would effectively abolish California's landmark 2006 global warming law. Texas oil companies are pledging tens of millions of dollars this fall in an effort to pass Proposition 23 and effectively repeal California's landmark global warming bill (AB 32). If Proposition 23 passes on November 2, it's a serious blow to our ability to take aggressive steps to slow climate change. If Proposition 23 is resoundingly defeated, we can show ourselves and the world that the people of the United States are ready to do what scientists say is necessary to address our global climate crisis. Depending on the outcome of the election this fall, our state will either be the world's leader in the fight against global warming, or it could become the latest casualty in corporate takeover of government. For more information and to volunteer with the campaign, www.stoptexasoil.org, stop by the Palo Alto office at 3491 El Camino Real, or email john@greencorps.org. The Biz of Baseball: "Oakland's Relocation into the South Bay is an Inevitability"
This week, The Biz of Baseball re-ranked their Top Ten Markets for Relocation or Expansion. In it, they looked at those national and international markets most primed for a Major League Baseball team. In their 2008 analysis, San Jose didn't even rank. However, the story is different in 2010. The most obvious eventual home for the Oakland Athletics, San Jose is the ideal mix of fans and corporate interests. There is enough benefit for both the league and the club to make this deal a question of when, not if. Whether it is Cisco Field or some other iteration, Oakland's relocation into the South Bay is an inevitability. Billed as a South First Friday on Steroids, this is one street fair you won't want to miss! AbsoluteZER0 is a vibrant street festival where the public can engage with art, music, science, and technology in new and compelling ways outside on city streets. 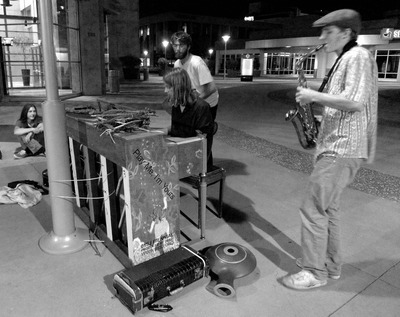 Growing out of the success of the SubZER0events during the June South First Friday, AbsoluteZER0 celebrates the creativity and technological virtuosity that are the hallmarks of Silicon Valley by showcasing art projects for public exhibition, performance, provocation, and interaction related to theme of the 3rd 01SJ Biennial, Build Your Own World. 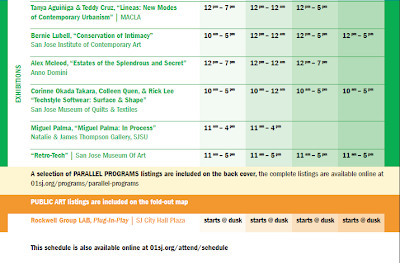 The event is free and open to the public and is presented in collaboration with Anno Domini Gallery, MACLA, San Jose Museum of Quilts and Textiles, and San Jose Institute of Contemporary Art. 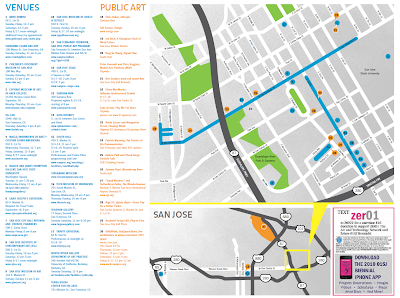 The street festival will take place from 6:00 pm to midnight on Friday, September 17, 2010 in the downtown San Jose SoFA Districtalong South First Street between San Carlos and East Reed, and along San Salvador between First Street and South Hall where ZER01’s Future Films Program and Out of the Garage, Into the World project space will feature even more work by artists working at the intersection of art and technology. San Jose Underground Food Market Tomorrow! Fri 9/17/10 San Jose Underground Market! 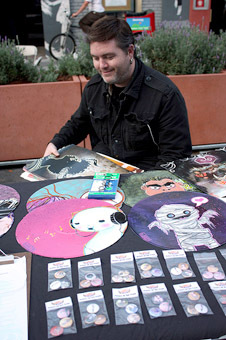 We're getting a SJ Underground Market in conjunction with AbsoluteZER0 Street Festival - 2010 01SJ Biennial. I've tried Kitchen Sidecar which makes a good banh mi burger. What else should I try? Vendor list for this Fridays Underground Market in San Jose below. California Cane & Fruit Co. If you're like me, you're probably wondering what the heck PARK(ing) Day is. Turns out, it's a worldwide event that encourages city dwellers to turn metered parking spots into temporary parks for the public good. Basically, it's an event to raise awareness for the need for more urban green space. 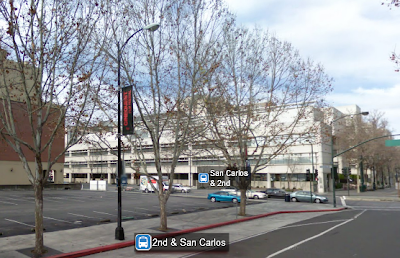 San Jose has a group created by the Greenbelt Alliance, the Silicon Valley Bicycle Coalition, and the San Jose Parks Foundation that will be PARK(ing) at the corner of 2nd & San Carlos tomorrow. Great timing with Zer01 hitting full swing tomorrow! 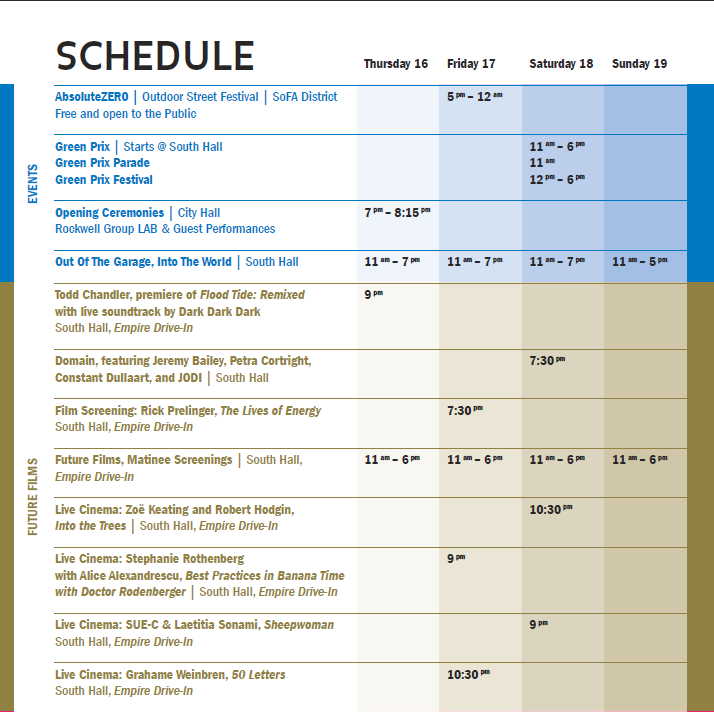 For the full schedule of everything going down over the next 4 days, just click on the images below to expand them, or print the schedule using this PDF link! Psycho Donuts is Coming to Downtown San Jose! Comedy Sports and Psycho Donuts are teaming up to give everyone a worthwhile premiere of downtown's first true donut shop tomorrow at Camera3. If you haven't heard of Psycho Donuts before, then you will definitely have to click on this link to see the abominations they've created =). Join us in celebrating the opening of a SECOND location for Psycho Donuts...at ComedySportz in Downtown San Jose! The wildly popular and crazy trademark donut creations will now be a part of the Downtown experience as they join up with ComedySportz, the live improv comedy show, to transform the inside of Camera 3 and make for a truly interactive experience for donut lovers and comedy goers alike. There is no other spot like it in downtown! • TAKE PHOTOS in the Padded Pfoto Cell- New and improved! Invite your friends and family and we'll see you then! *RSVP here for your attendance and to take part in our Facebook Fan-exclusive giveaway"
Just a quick heads up to let everyone know that 4 great bands are playing at the HP Pavilion as part of the 2010 Honda Civic Tour this Friday: Kadawatha (cool pop-rock band based out of Sri Lanka), Tegan and Sara, New Found Glory, and Paramore. The Genghis Khan exhibit at The Tech will only be available until October 24th. I've been hunting for some promotional codes, and the best one I've been able to find so far is LEXUS, which brings a $25 adult ticket down to $20 (just enter this code when you log in or create a Tech account). Member of the museum only pay $15 for an adult ticket. If anyone out there has a better discount code, please don't hesitate to post it in the comments! Details on the special exhibit below. This is probably my favorite 01 exhibit so far. 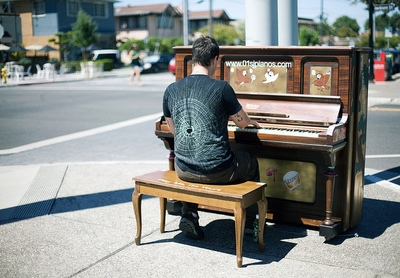 20 decorated piano's have been placed across San Jose, most of them Downtown. Anyone can walk up to them and just start playing. 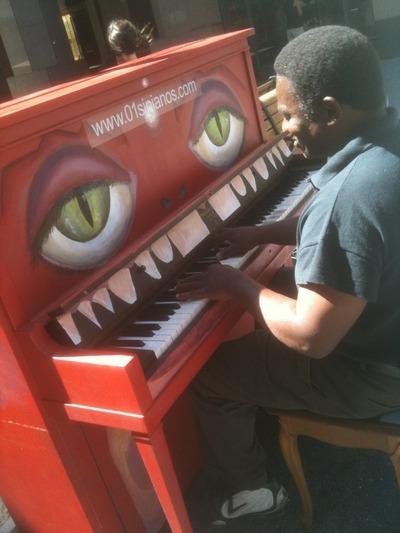 A couple weeks ago I was walking down Paseo de San Antonio and heard some jazzy piano music accompanied by singing. 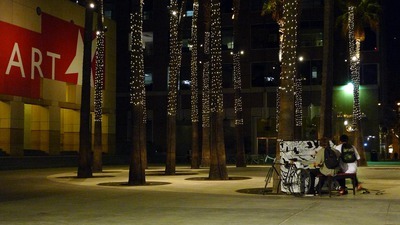 It really seemed to add so much life downtown, I couldn't wait to find out where the music was coming from. At first, I thought it was a hired professional, but as I got closer I discovered just a normal guy playing his heart out. 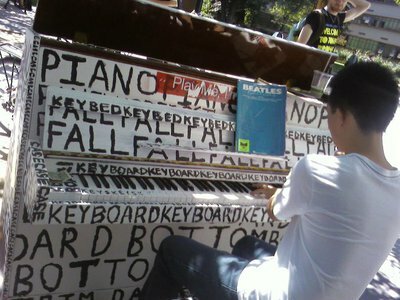 There wasn't even a crowd he was playing for, he was just playing because it was clearly something he loved to do.